MooCash: Is It Legit Or A Scam? There’s a lot of ways to make money online. For the most part, they are legitimate. And let’s not forget that there are also some bad apples that are in the bunch. It is for that reason why some people feel weary to the idea of making money online. But our mission here is to put you at ease to tell you that it is possible to make a decent amount of money online through so many mediums. We will tell you which ones are legit or just plain scammy. Because the last thing we want is your online money making experience to be a bad one. Today, we’ll be looking into an opportunity known as “MooCash”. 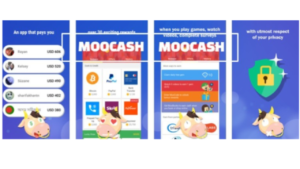 So the question is can you earn money online simply by using a mobile app like MooCash? The short answer: it depends. The long answer: it depends on how it is all structured. What do we mean by this? Let’s take an app like AppBounty. The way they have it set up is members can download apps and earn enough points to redeem them for gift cards. They don’t earn money at all. However, if they meet specific qualifications, they can become a media partner. And media partners are the ones who actually earn the money. So does MooCash adopt the same structure? Is it a real money making opportunity? Let’s dig into it now. While it is unclear who came up with the idea of MooCash, the service itself may be traced back as early as 2016. At this point, you may consider it a cause for concern when you can match a face to the name. But this is probably common for most mobile apps that are designed for making money. MooCash is available for both the Android and iOs platforms. On their website, they say that it’s available for download at the Google Play store and Apple’s App Store. However, the links do not lead you to either place. Instead, if you click to download the Android version, you are rerouted to a site where you can download the app via a third-party site. Any apps that are available for download outside of the Google Store or Apple’s App Store may serve as a red flag. The reason being is that apps that are download through third-party channels may contain viruses, malware, and some other baddies that may affect your phone. If you choose the iOs version, you’re redirected to a blog post on their site that teaches you how to download it manually. I’m sure they have every good intention of showing you how to download their app. But seeing it not available on approved sites like Google Play or App Store may set off an alarm bell. Remember, if you wish to download apps outside of those sites, please do it at your own risk. Once you have downloaded the app safely you open it up, the first thing you see looks quite similar. It’s set up the same way like SwagBucks or AppBounty. You earn coins that you can use to redeem rewards. How do you earn them? The concept is the same: you take surveys, download apps, visit pages, complete tasks, and so on. So you have a wide range of opportunities to earn. Once you reach the minimum of $2 USD, you can request a payout. The minimum payout may also be $5 USD depending on which tasks you do. So 1,000 coins is the equivalent of one dollar. So if you earn either 2000 or 5000 coins, that’s when you can be able to pay out. There is no equal, across the board value of coins that are distributed for every task you complete. Some tasks have a high value or pay, some are just as little as a few coins. So, once you earn enough, you can also redeem them for something else other than good old fashioned cash. You can redeem it for gift cards or airtime for your phone. If you choose to earn money, you can be able to have it sent to you by way of PayPal. At one point, it did has a bank transfer option. However, it was removed and probably for all the right reasons. MooCash has apps that are available in their “family”. These apps include MooJoy, MooBucks, and MooLuck. 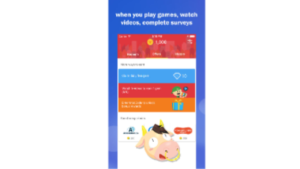 With MooJoy, you can play games and win free rewards. MooBucks is an app that will offer you discounts when you shop through certain brands online. Finally with MooLuck, you’ll have the opportunity to sign up for raffles and win prizes like cash and gift cards. 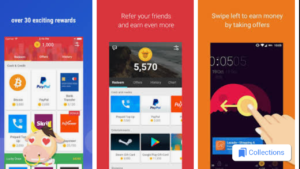 Oddly enough, you can download these apps by way of the Google Play store. Payout minimum of 2000 coins or $2 is pretty reasonable. Some apps will have a minimum payout of way more than that. Payouts made available through Paypal. Meaning you can earn cash as an option. There are other rewards options available if you really don’t need the money. You earn 30 coins for every successful referral. Your friend gets 30 coins to start out. Payouts will take about 72 hours. Paypal will charge a 3% transaction fee plus $.30 for each transaction. The app itself is available outside of Google Play and the App Store, which may raise some concerns. To conclude, MooCash is a legitimate opportunity. 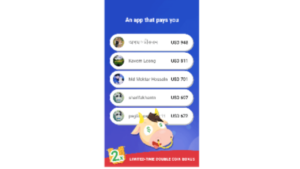 You can earn money through the app. But don’t expect to get rich off apps like this. One question that needs to be asked is why is this app in particular excluded from Google Play and the App Store while the other apps in the “MooCash” family can be downloaded from those places? Either way, you’re welcome to download the app, but you’ll need to do so at your own risk. The same applies for any other app that you download outside of Google Play or the App Store. Do you have any experience with using MooCash? Do you have any questions concerning my “MooCash” scam review? If you do, please leave your comments or questions below, and I will be more than happy to get back to you. Thanks again for checking out my post, and good luck with your success online..
Online Investment Scams-They’re Out There! !